Meet at PHC café at 10.15am. Richard will take us around Colne and Trawden looking at some of the remains of the industrial past, in particular the old coal mining industry. If the weather is inclement, there will be activities in the Green Room. 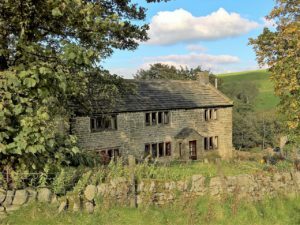 Seghole Farmhouse, Trawden. Attribution: trappedinburnley. Terrain: Mixed, some ascent and descent. Wear stout boots. Wear clothing and footwear appropriate for Lancashire weather! Bring a packed lunch and a warm drink.